They work. A well executed email splash page harvests email addresses from between 10-30% of visitors, depending on audience, message, etc. Visitors hate them. Splash pages put a barrier between the user and the content they are looking for. Even when well executed, you will probably see between 20-50% users bail without visiting another page. Ever usability study I’ve seen says not to use splash pages. When I consult with clients, we talk through whether the increased conversion rates brought about by splash pages are worth the problems they cause for users. Sometimes the answer is yes. Sometimes it is no. It really depends on the overriding mission of the website. Yesterday I visited the White House website for the first time in awhile and was surprised to see an email splash page featuring President Obama. When I cleared my cookies and visited again today, I saw the version at the top of this post, indicating the White House is experimenting with different versions. If this were the website for President Obama’s reelection campaign I wouldn’t think twice about it. Emails = donations, and donations are the fuel for all campaigns. Harvest away. Perhaps I’m a hopeless optimist, but it seems to me that the White House website, which is paid for by taxpayers, should have a purpose higher than conversions. 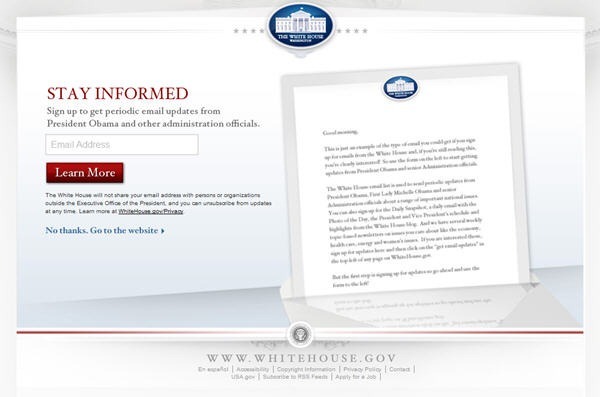 The number one priority of the White House site should be to inform. Putting up a splash page that will automatically drive away a large percentage of visitors seems counter to the spirit of the enterprise. Mr. President, tear down this wall.